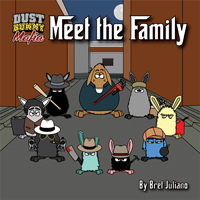 Vinnie the Mouth: "Creatures of the jury: You heard with what cold cruelty the prosecution referred to the sins of this dust bunny, as if his condition were of his own preference. The evidence has painted you a picture of his life and surroundings." Vinnie the Mouth: "Do you think that they were embraced of his own choosing? Do you think that he willingly embraced a life so revolting and horrible? Ah, no! Creatures, our own government was the author of his ruin!" Steel Toes: [thinking] "This sounds a lot like the Soiled Dove Plea..."